DESCRIPTION: It is suitable for use in all sanitary and Sewage Treatment Systems and can be used with common materials such as stainless steel, steel, PVC, polyethylene and polypropylene. Toilet bowl cleaner has been made with a uric and calcium scale removing formula to prevent buildup within sanitary lines. Made with low foaming surfactants with additional anti foaming additives. Making it friendly for Vacuum toilets. Contains a lubricant to protect any rubber components. 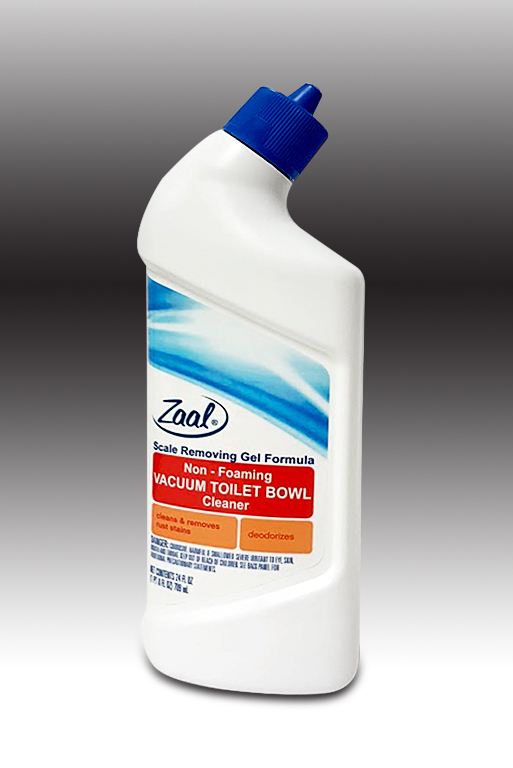 Deep cleaning action of the product for toilet bowls, urinals and surrounding areas eliminates the source of unpleasant odors and provides an improved working environment The gel formula sticks to porcelain surfaces and extends contact time for greater cleaning of the hard surfaces. When flushed this gel sticks to irregular surface areas in the pipe to soften and dissolve scale. Product packaged in retail consumer commodity for ease of use and for non-regulated shipping by ground and sea . Squirt aprox. one oz into the toilet and under the toilet rim, sufficient to coat the area to be cleaned. Leave to soak for several minutes. If needed, scrub with toilet brush. Flush.